In this case, the fifth iteration resulted in the orbit being trapped. 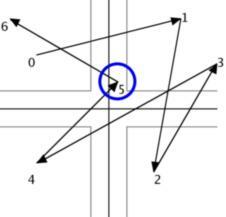 All points belonging to the same “stalk” as that point will in fact also be trapped on the fifth iteration. For other stalks, it might be the fourth or the sixth or the tenth, etc. A region split by orbit will split the trap region into separate regions based on this iteration value, depending on how many regions were specified in the Orbit parameters dialog. If you specify two, then all points that were trapped with even iteration values will belong to one region and those trapped with odd iteration values will belong to the other region. If you specify three regions, then points trapped with iteration counts that have the same remainder when divided by three will belong to the same region. The effect in most cases is that trap regions appear to be interleaved as can be seen in the following diagrams showing a zoom sequence from the image on the previous page. You can see how the stalks that appear in a regular series are generally colored in the sequence: gray, blue, red, gray, blue, red. 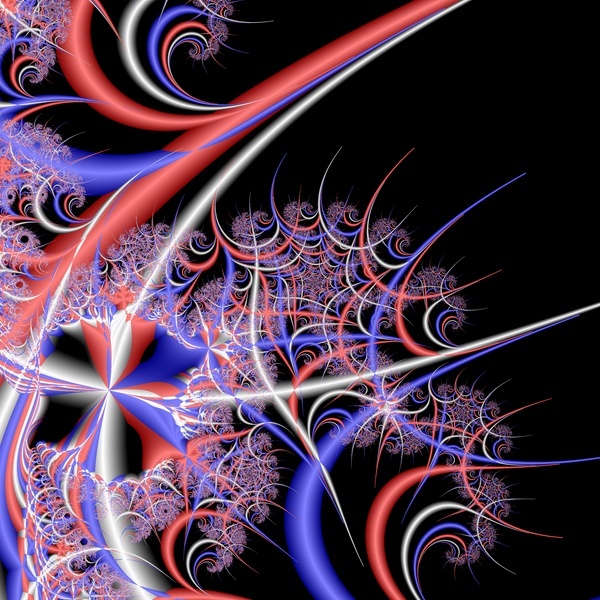 Fractal Domains provides up to five default gradients: gray, blue, red, green and yellow. After that they just repeat, but you can modify the coloring of any region via the Color Map Editor.